About a month or so ago I was contacted by one of the people at Cocoa Brown, asking if I would be interested in reviewing the product for my blog. Oh wow! That was my first though...this is my very first sponsored product, and I was really happy to have my humble little scribblings chosen by such a impressive up-and-coming beauty company! I was not paid for this and I cannot stress this enough - although the product was sent to me, my opinion is genuine and has not been altered by any sort of 'deals'. First of all, I have to put this out there - Cocoa Brown people seem to be quite amazing! The person I talked to was incredibly friendly and accommodating, even when the post office screwed up and lost the initial package, I was sent a new one - thankfully this one reached me without any issues. So, after the initial post office mess, I received my 'pretty in pink' package - everything from the business card to the envelope itself is the trademark fuscia pink color. I have to say, this shade is very eye catching, and not tacky or childish (one does risk that with shades of pink). On the contrary, I feel it fits the product - the color and the design is bright and cheerful, somehow reminds me of a tropical hotel and cocktails at the pool. And isn't that the look you're going for when using this - as if you just stepped out of a plane from somewhere in Caribbean. Packaging fist - the bottle comes safely sealed, so you don't have to worry about it bursting in transit (if you're ordering this online) and you can be assured it's brand spanking new! The cap itself screws on securely, and the lid shuts tightly. If you want to travel with it, it should not present any problems (but I always suggest placing your liquids inside plastic bags). It's a regular squeeze tube with a smaller hole, which I find perfect for getting out just enough. 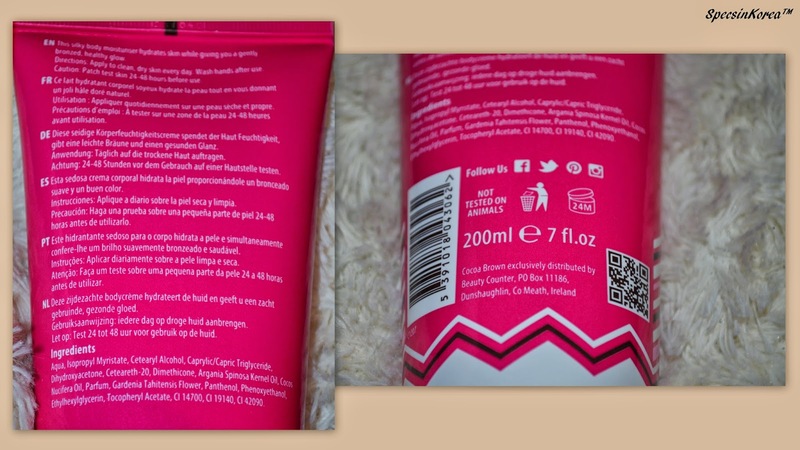 On the packaging you'll find a brief description and very easy to follow instructions printed in 5 languages (which is a great thing) as well as the ingredients and icons that indicate which Social Media platforms you can find Cocoa Brown at. Cocoa Brown Gentle Bronze Gradual Tan raises the beauty bar with a product that promises to deliver beautiful skin. How does it do that? -Moisturise your skin and leaves it beautifully hydrated. -If applied each day, it allows you to build your colour from a light glow to a ‘Gentle Bronze’! Now for the product itself - I actually really enjoy using it! Let's get some things straight first - I hate tanning. Honestly, I'll go to great lengths to avoid being in the sun. Even when I was vacationing in Egypt, unless I was in the pool (with a thick layer of waterproof SPF50 sunblock) I was always huddled up under a parasol. I enjoy having fair skin, not to mention I have no desire to speed up the aging process. However, this has one teeny tiny drawback - my legs always look like I expired about 2 hours ago. Pale, bluish...it's a nightmare in summer. I tried self tanning lotion ONCE and I swore - never again. I hated the sickly scent and the color - it made me a very strange shade of muddy orangey brown-ish, which on my skin tone looked horrible (I am not exaggerating, I scrubbed my skin raw with lemon and sugar to get it off). The person at Cocoa Brown was incredibly nice, even though I said that I don't use self tanning products, and offered me the 'beginners' best friend - Gentle Bronze Gradual Tan lotion. It's really the best choice if you're just dipping your toes in these waters! The lotion itself has a creamy, almost whipped cream like consistency and is pale brown in color. It spreads easily and absorbs quickly, leaving the skin moisturized. Not to mention that it smells divine! This has the scent of Tahitian Gardenia, which happens to be one of my favorite scents. It's really lovely and fresh, not sickly sweet or overly floral (though it is floral, can't take that away). However, it doesn't linger for long, so don't worry if you are not a big fan of scented products. I have to say that the color is perfect. On my arm you see about two layers, after 3 days. This is about as far as I'd go with the tan, because I'm rather fair, I don't want to go any darker than I naturally would. The only difference - this involved none of that damaging sunlight (and it doesn't leave tan lines *wink wink*). I tested it on my arm first, because I wanted to see if the tan really develops further and whether it would get to that weird orangey brown. Nope! I tried taking a shot of my legs before and after, but because my legs really are like that of a dead person, I couldn't get an accurate image - do apologize for that. If you keep applying it every day, the tan will intensify (but only to a very light shade of bronze, nothing crazy). If you leave it as is and take showers daily, it will last for about 4 days before fading. It doesn't seem to leave any blotches when fading, so you don't have to worry about that. As an added bonus, your skin will be wonderfully soft and smooth, because of the added Argan and Coconut oils! All in all, this product is a winner for me. I am not a fake tan girl, and you will never see me with tanned skin. However, the bronze glow this product gives is wonderful as it makes it look like you've spent a few days lounging around the pool somewhere around the Caribbean, without the risk of skin cancer or premature aging. I imagine this would make a great Christmas present as well! I'm using this now every other day, because I like that my legs don't look like I was pulled out of the river a short while ago, while I'm working out at the gym! The ONLY con could be the amount - applied daily the 200ml won't last too long a time. Will I (re)purchase this: Yes! This will definitely appear often on my dresser, especially nearing the warmer months! Verdict: I really enjoy this product, although I'm generally not a fan of fake tan. It looks natural and adds just enough healthy glow to the skin. Not to mention, there's no Oompa-Loompa look going on even if you apply it daily. Check it out, definitely! That is it for this week's Minute Beauty post, I really hope you enjoyed it and give Cocoa Brown line a chance. I know that you might be less enthused because this is a sponsored post, but I repeat once more - my opinion is genuinely honest and I am receiving no profit from this!